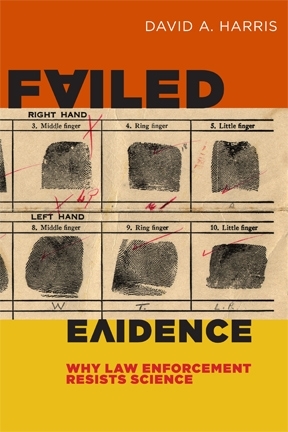 I’ll be presenting two talks on my book Failed Evidence: Why Law Enforcement Resists Science (2012) in Cleveland on Wednesday, July 17. The first event, at noon will be at noon, part of the ACLU’s Brown Bag series; details here. The second will take place at 7:00 pm; click here for details and RSVP information. Both events are free and open to the public. Location for both the Wohl Civil Liberties Center, 4506 Chester Ave., Cleveland, OH 44103. The talks are sponsored by the American Civil Liberties Union of Ohio and the Ohio Association of Criminal Defense Lawyers; non-members are welcome and encouraged to attend. The 7:00 pm event (but not the noon event) has been approved for 1.0 units of Ohio CLE credit. We’ll have a full discussion of the big issue: with science such an important part of life, why does law enforcement ignore so much of it that could improve the criminal investigation process? We’ll also get into concrete suggestions for improvement. The technique seems to be designed for entrapment and even a bit of brainwashing. Is this perception accurate? I guess I would put it a little differently, though I do understand why you would see it that way. The Reid technique for interrogation is not a process designed for the discovery of facts and evidence. Rather, it is a multi-phase process, to be used when the interrogator has already concluded that the subject is guilty, and therefore simply needs the confession out of the person to confirm the guilt and prove it.